HOWARD, the Hand-Wrist Assisting Robotic Device is a robotic therapy device that may help people regain normal strength and use of their hands following a stroke. Stroke causes more long-term disability than any other disease; more than 700,000 Americans suffer strokes annually. Researchers at the University of California, Irvine report that patients have improved ability to grasp and release objects after therapy sessions with HOWARD. 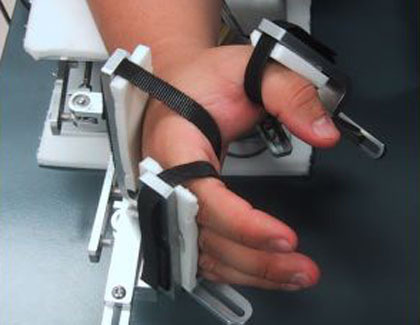 The Hand-Wrist Assisting Robotic Device wraps around the hand and, in concert with a computer program, directs patients through a physical therapy session. The user initiates hand movement on his or her own; HOWARD monitors the movement and provides assistance to complete each activity. HOWARD does more than provide assistance for muscular development. The system helps the brain relearn how to perform tasks. Also, HOWARD captures data from each session, providing an accurate assessment of progress. Patients using HOWARD developed a 17 percent greater range of motion and a 20 percent increase in measured dexterity. UCI researchers are already at work planning a "son of HOWARD" with improved hand-robot connections and more software options to individualize therapy and keep patients interested. Read more about HOWARD here and here.